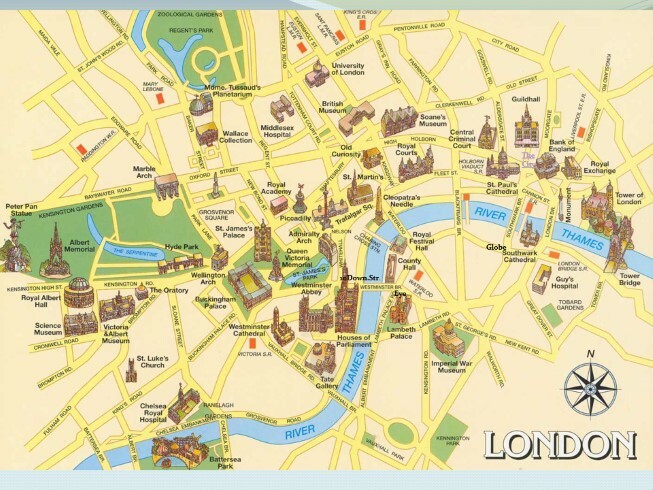 The City is an area in London which covers one square mile ( 2.5 square kilometres ) and sometimes is called the Square Mile. It is the oldest part of London. It was established by the Romans in 43 AD, when they surrounded this mile with a wall and called it “Londinium”. Now it is the British business center where many companies and banks are situated. Few people live in the City but about half a million people travel there each day to work. At night it is almost deserted. 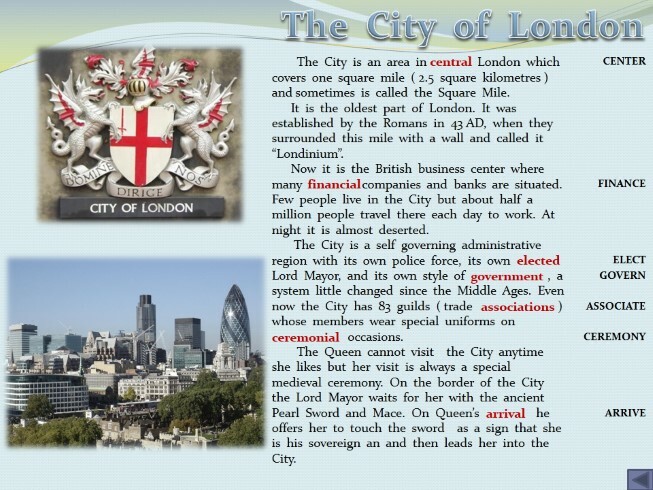 The City is a self governing administrative region with its own police force, its own Lord Mayor, and its own style of , a system little changed since the Middle Ages. Even now the City has 83 guilds ( trade ) whose members wear special uniforms on occasions. The Queen cannot visit the City anytime she likes but her visit is always a special medieval ceremony. On the border of the City the Lord Mayor waits for her with the ancient Pearl Sword and Mace. On Queen’s he offers her to touch the sword as a sign that she is his sovereign an and then leads her into the City. Until the mid-18th century London Bridge was the only River Thames crossing and before Tower Bridge was built it was the last before the open sea. The need for an open waterway for high-mastered ships as well as crossing for traffic and pedestrians was urgent. This bridge in 1894 and now it’s one of London’s known landmarks. 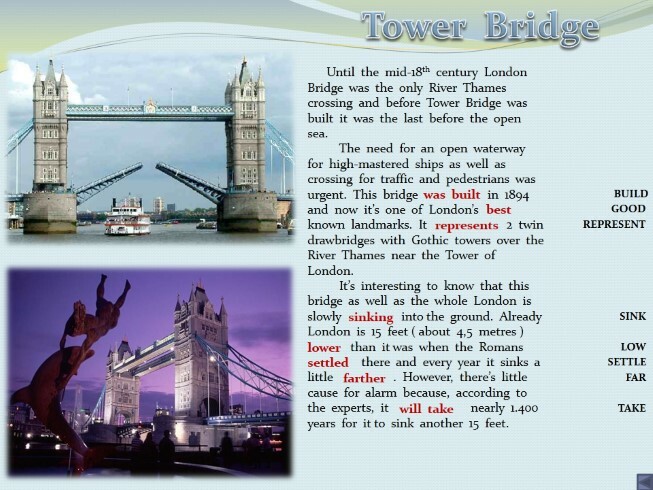 It 2 twin drawbridges with Gothic towers over the River Thames near the Tower of London. It’s interesting to know that this bridge as well as the whole London is slowly into the ground. Already London is 15 feet ( about 4,5 metres ) than it was when the Romans there and every year it sinks a little . 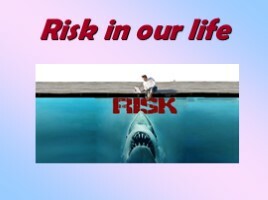 However, there’s little cause for alarm because, according to the experts, it nearly 1.400 years for it to sink another 15 feet. It is the oldest surviving building in London, dating the Norman Conquest. In its long history the Tower has served many purposes: as a fortress, a Royal Palace, a prison, a treasury, an arsenal, a royal observatory, a royal zoo and now it’s a museum and the main tourist . Today the Tower of London houses the unique collection of arms and armour and the Crown Jewels. The Crown Jewels represent the world’s largest and most valuable collection of royal regalia, gold plate and famous diamonds. In the Tower of London you can see yeoman warders (royal bodyguards). They are often called “Beefeaters”. 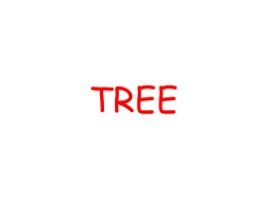 This means “one who eats beef”. The Beefeaters are ex-army men. Today they work guides and are the most photographed people in Britain. The Tower is also famous its ravens that have lived here for about 1 000 years. The legend says that if they ever leave the Tower, the Crown and England will . So they are under royal . No 10, Downing Street is the London residence of the Prime Minister. He lives here when in London. It also houses his or her secretariat. Here meets the Cabinet. 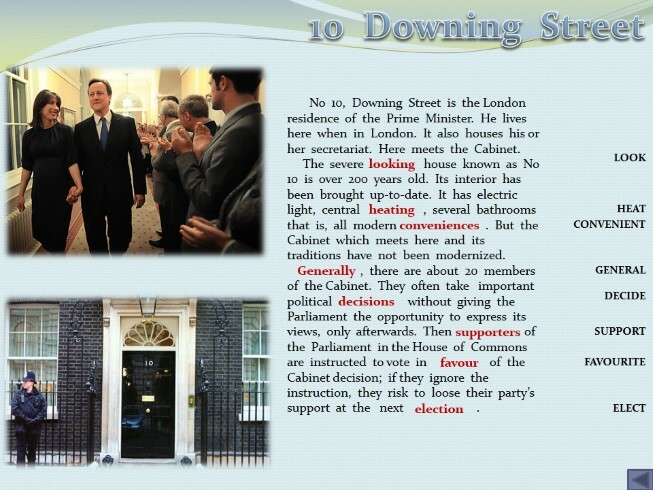 The severe house known as No 10 is over 200 years old. Its interior has been brought up-to-date. It has electric light, central , several bathrooms that is, all modern . But the Cabinet which meets here and its traditions have not been modernized. 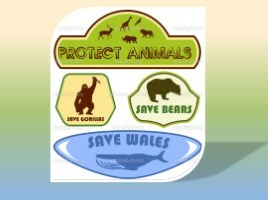 , there are about 20 members of the Cabinet. They often take important political without giving the Parliament the opportunity to express its views, only afterwards. Then of the Parliament in the House of Commons are instructed to vote in of the Cabinet decision; if they ignore the instruction, they risk to loose their party’s support at the next . 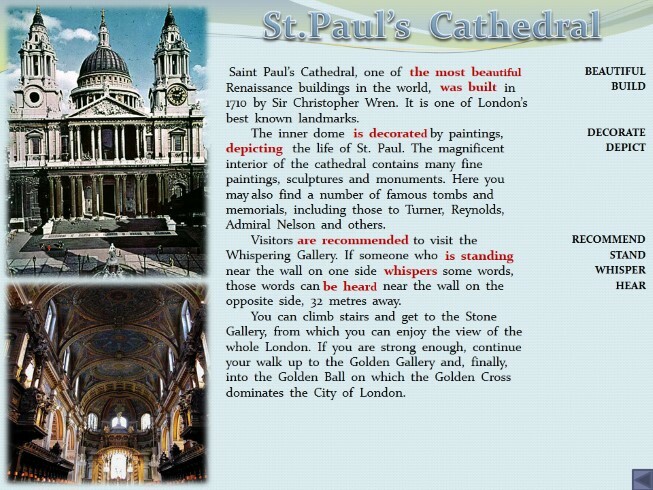 Saint Paul’s Cathedral, one of Renaissance buildings in the world, in 1710 by Sir Christopher Wren. 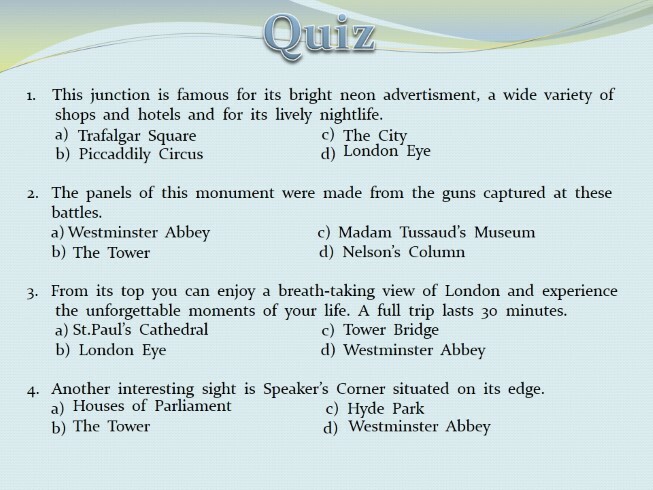 It is one of London’s best known landmarks. The inner dome by paintings, the life of St. Paul. The magnificent interior of the cathedral contains many fine paintings, sculptures and monuments. Here you may also find a number of famous tombs and memorials, including those to Turner, Reynolds, Admiral Nelson and others. Visitors to visit the Whispering Gallery. If someone who near the wall on one side some words, those words can near the wall on the opposite side, 32 metres away. 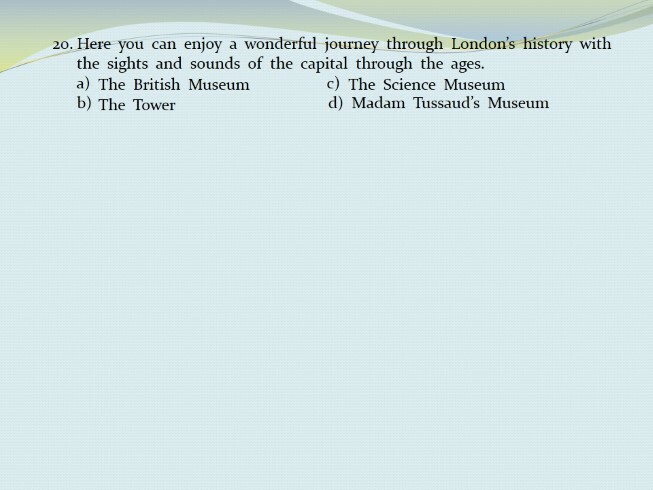 You can climb stairs and get to the Stone Gallery, from which you can enjoy the view of the whole London. If you are strong enough, continue your walk up to the Golden Gallery and, finally, into the Golden Ball on which the Golden Cross dominates the City of London. Buckingham palace has been a home for seven generations of British kings and queens and it is the symbol of monarchy. 355 people work for the Queen here today. There are 19 State rooms in the Palace, 53 Royal and Guests bedrooms, 600 rooms in all. Heads of State, leaders of the Commonwealth and diplomats are invited here ( the Queen about 30.000 guests every year). Once a week the Prime Minister comes at 6.30pm for an . It is an absolute private exchange of views. When Her Majesty the Queen is in residence, you can see the flag the Palace. The moment Her Majesty leaves the Palace, down it comes. In front of Buckingham House there is a monument to Queen Victoria, who loved this Palace very much because of happy years with her husband Albert. Every morning in front of the Palace you can see a ceremony: The Changing of the Guard. Guards in red uniform and black hats ( bearskins ) down the Mall to music from band and replace others. Behind the Palace there is a beautiful park where the Queen holds usually in June a garden party for political leaders. 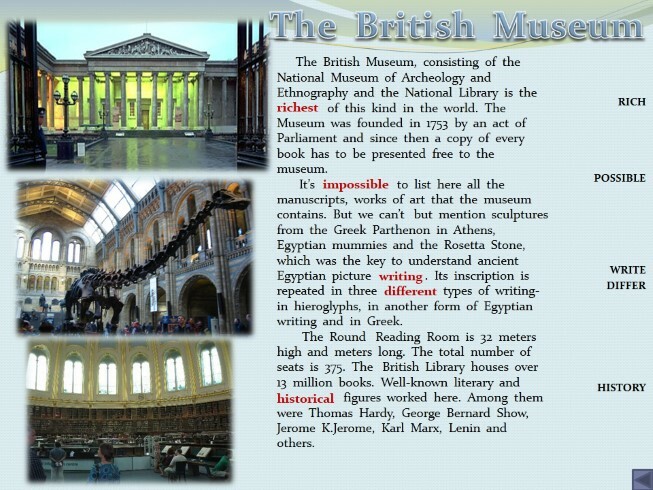 The British Museum, consisting of the National Museum of Archeology and Ethnography and the National Library is the of this kind in the world. The Museum was founded in 1753 by an act of Parliament and since then a copy of every book has to be presented free to the museum. It’s to list here all the manuscripts, works of art that the museum contains. But we can’t but mention sculptures from the Greek Parthenon in Athens, Egyptian mummies and the Rosetta Stone, which was the key to understand ancient Egyptian picture . Its inscription is repeated in three types of writing- in hieroglyphs, in another form of Egyptian writing and in Greek. The Round Reading Room is 32 meters high and meters long. The total number of seats is 375. The British Library houses over 13 million books. Well-known literary and figures worked here. Among them were Thomas Hardy, George Bernard Show, Jerome K.Jerome, Karl Marx, Lenin and others. 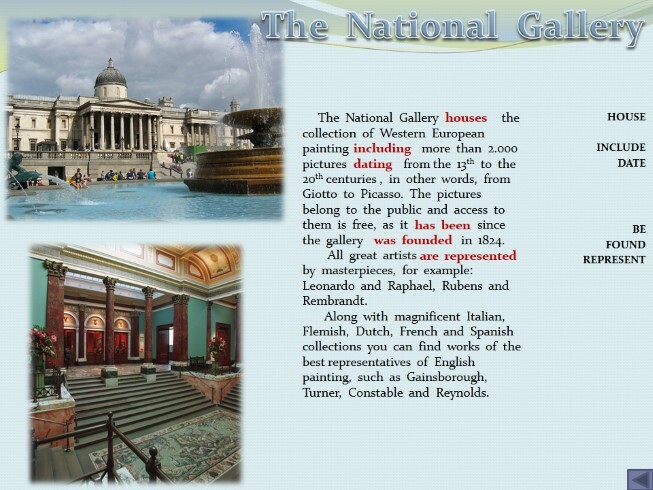 The National Gallery the collection of Western European painting more than 2.000 pictures from the 13th to the 20th centuries , in other words, from Giotto to Picasso. The pictures belong to the public and access to them is free, as it since the gallery in 1824. All great artists by masterpieces, for example: Leonardo and Raphael, Rubens and Rembrandt. Along with magnificent Italian, Flemish, Dutch, French and Spanish collections you can find works of the best representatives of English painting, such as Gainsborough, Turner, Constable and Reynolds. The Houses of Parliament or the Palace of Westminster has been the of government since the 11th century, but the present Neo-Gothic building dates 1850. 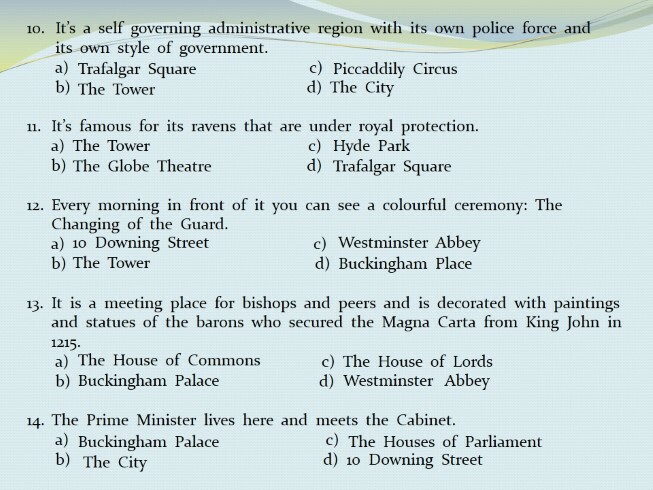 The most famous part of it is the Clock Tower or Big Ben (actually the name of the bell). It was called so after the architect Sir Benjamin Hall, a very tall and stout man, nickname was “Big Ben”. 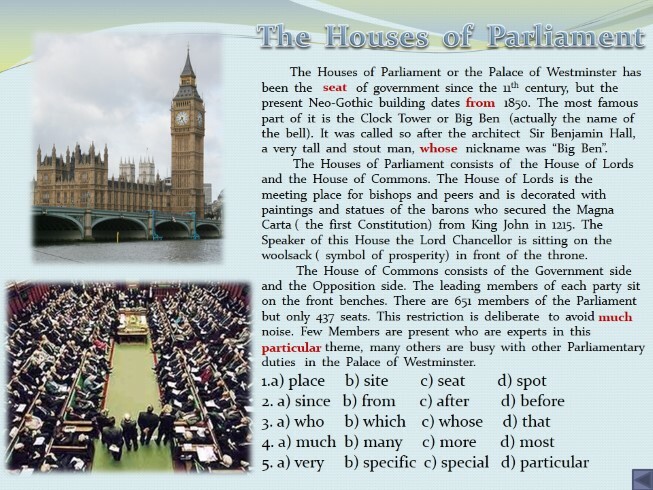 The Houses of Parliament consists of the House of Lords and the House of Commons. The House of Lords is the meeting place for bishops and peers and is decorated with paintings and statues of the barons who secured the Magna Carta ( the first Constitution) from King John in 1215. The Speaker of this House the Lord Chancellor is sitting on the woolsack ( symbol of prosperity) in front of the throne. The House of Commons consists of the Government side and the Opposition side. The leading members of each party sit on the front benches. There are 651 members of the Parliament but only 437 seats. This restriction is deliberate to avoid noise. Few Members are present who are experts in this theme, many others are busy with other Parliamentary duties in the Palace of Westminster. The collection of the museum demonstrates the of science to technology and the development of and industry from their begin nings to the present day. 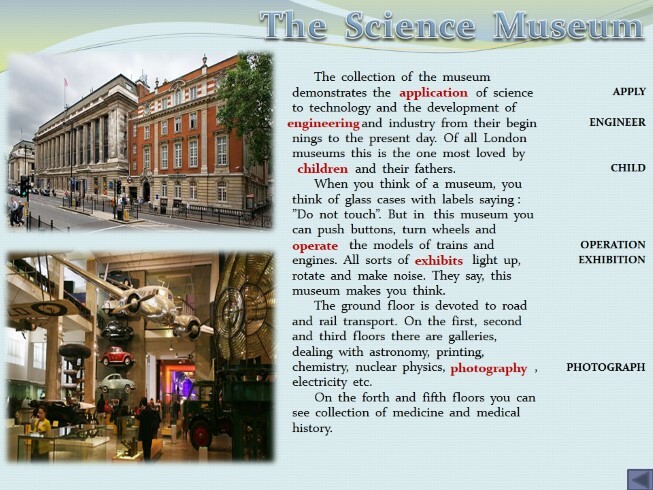 Of all London museums this is the one most loved by and their fathers. When you think of a museum, you think of glass cases with labels saying : ”Do not touch”. But in this museum you can push buttons, turn wheels and the models of trains and engines. All sorts of light up, rotate and make noise. They say, this museum makes you think. The ground floor is devoted to road and rail transport. On the first, second and third floors there are galleries, dealing with astronomy, printing, chemistry, nuclear physics, , electricity etc. On the forth and fifth floors you can see collection of medicine and medical history. The Tate Gallery two national collections in one: British art from the 16th century to around 1900 and international modern art from the Impressionists until now. in 1897, the gallery after the sugar millionaire Sir Henry Tate, who his Victorian paintings and for the building. 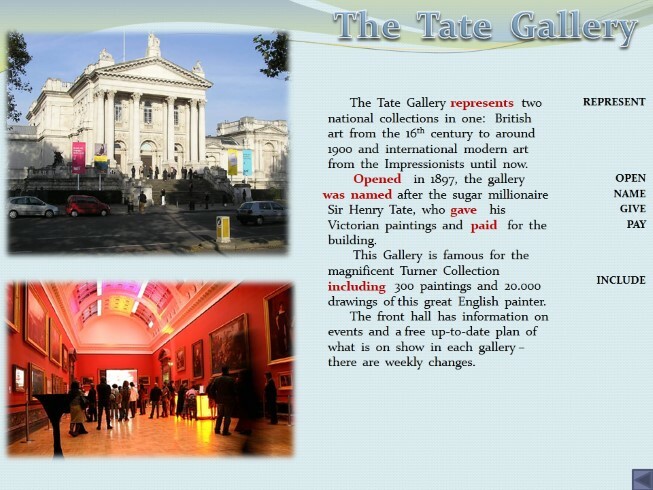 This Gallery is famous for the magnificent Turner Collection 300 paintings and 20.000 drawings of this great English painter. The front hall has information on events and a free up-to-date plan of what is on show in each gallery – there are weekly changes. 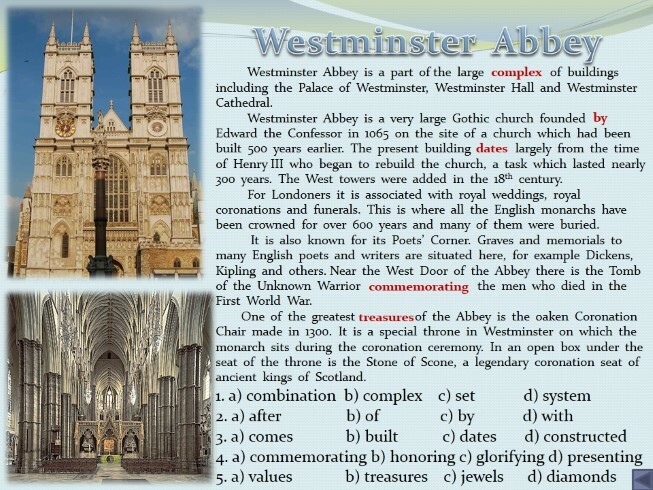 Westminster Abbey is a part of the large of buildings including the Palace of Westminster, Westminster Hall and Westminster Cathedral. Westminster Abbey is a very large Gothic church founded Edward the Confessor in 1065 on the site of a church which had been built 500 years earlier. The present building largely from the time of Henry III who began to rebuild the church, a task which lasted nearly 300 years. The West towers were added in the 18th century. For Londoners it is associated with royal weddings, royal coronations and funerals. This is where all the English monarchs have been crowned for over 600 years and many of them were buried. 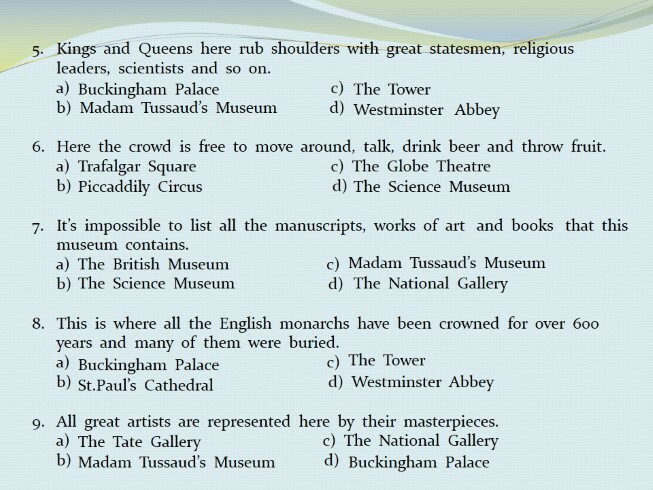 It is also known for its Poets’ Corner. Graves and memorials to many English poets and writers are situated here, for example Dickens, Kipling and others. Near the West Door of the Abbey there is the Tomb of the Unknown Warrior the men who died in the First World War. One of the greatest of the Abbey is the oaken Coronation Chair made in 1300. It is a special throne in Westminster on which the monarch sits during the coronation ceremony. In an open box under the seat of the throne is the Stone of Scone, a legendary coronation seat of ancient kings of Scotland. 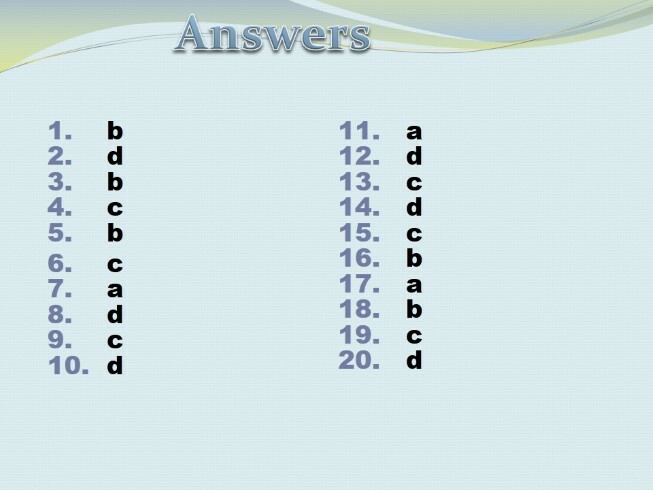 It is a well-known road junction in central London where a number of famous streets meet. The word “piccadillies” meant high fancy collars sold there . The junction is famous for its bright neon , a wide variety of shops, hotels and for its nightlife. In the centre of the junction stands the memorial, known as Eros with a fountain around it, which became a much-loved symbol of London and a traditional place for young people. In fact, it portrays not Eros ( god of love) but the Angel of Christian Charity and was made to commemorate the philanthropist and statesman Antony Ashley Cooper, 7th earl of Shaftsbury who fought for conditions for factory workers and for better for the poor. 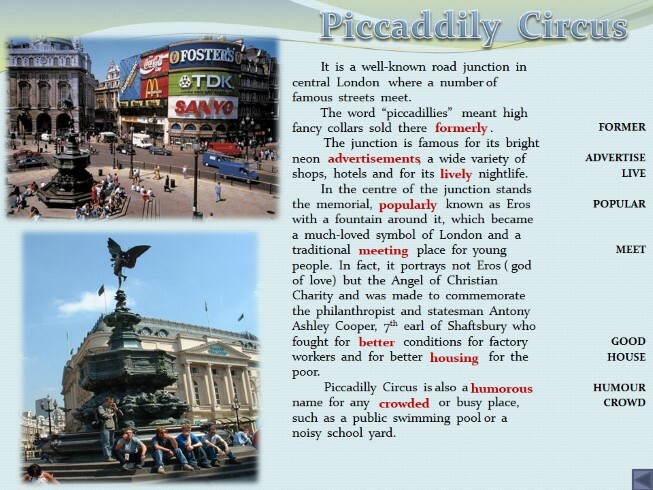 Piccadilly Circus is also a name for any or busy place, such as a public swimming pool or a noisy school yard. 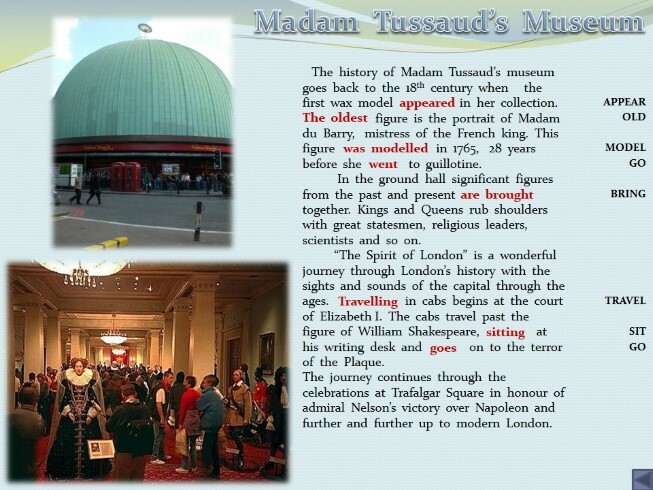 The history of Madam Tussaud’s museum goes back to the 18th century when the first wax model in her collection. figure is the portrait of Madam du Barry, mistress of the French king. This figure in 1765, 28 years before she to guillotine. In the ground hall significant figures from the past and present together. Kings and Queens rub shoulders with great statesmen, religious leaders, scientists and so on. 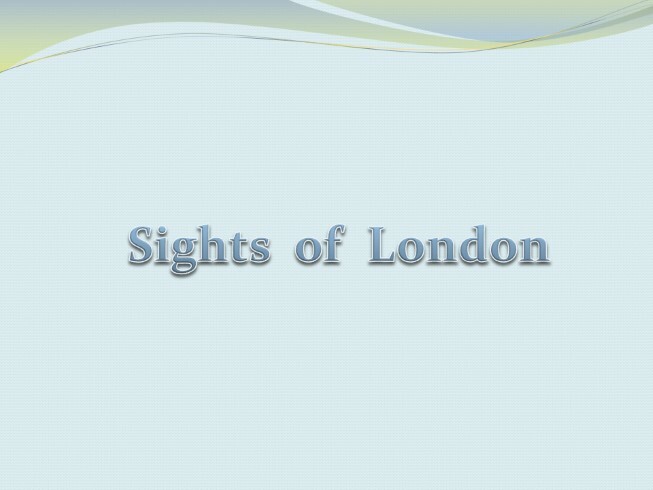 “The Spirit of London” is a wonderful journey through London’s history with the sights and sounds of the capital through the ages. in cabs begins at the court of Elizabeth I. The cabs travel past the figure of William Shakespeare, at his writing desk and on to the terror of the Plaque. The journey continues through the celebrations at Trafalgar Square in honour of admiral Nelson’s victory over Napoleon and further and further up to modern London. Trafalgar Square is the natural center of London, where Pall Mall, the Strand and Charring Cross Road meet. The square was so named to commemorate Admiral Nelson’s victory at the Battle of Trafalgar in 1805. Here you can see a very tall column built in of Nelson with a statue of him on the top. The pedestal of the column is decorated with panels representing his most familiar victories. These panels were made from the guns at these battles. Round the base of the column you can see four bronze lions and four fountains. into the fountains on New Year’s Eve is a favourite sport for Londoners. The Square is also known the large number of pigeons which come here and many tourists them. Trafalgar Square is a popular meeting place for political and other demonstrations against this or that thing. On the other side of the Square there are the National Gallery and the National Portrait Gallery. Данная презентация имеет две цели: Изучение достопримечательностей Лондона; Подготовка учащихся к ЕГЭ (раздел: Use of English) Достижение первой цели осуществляется через следующие приемы работы с презентацией: показ достопримечательностей по карте Лондона; угадывание достопримечательностей по фотографиям (показ начинается по щелчку с нижнего фото, которое труднее угадать, потом – верхнее фото, потом - название и далее - текст.) после заполнения пропусков работу с текстом можно проводить разными методами, которыми владеет учитель ( перевод, вопросно-ответные упражнения, найти эквиваленты на русском и английском языках, доказать, согласиться-не согласиться.) после прокрутки «мышки» назад и исчезновения текста учащиеся могут пересказать его, выразить свое отношение и сравнить данную достопримечательность с другими в России и в мире. Достижение второй цели имеет следующие особенности: при последовательной работе с видами Лондона каждый слайд сначала направлен на отработку лексики, следующий - на отработку грамматики и каждый третий слайд проверяет знание синонимов, предлогов и фразовых глаголов. При работе с лексическим слайдом учащемуся для заполнения пропуска следует ответить последовательно на три вопроса: какая часть речи пропущена? 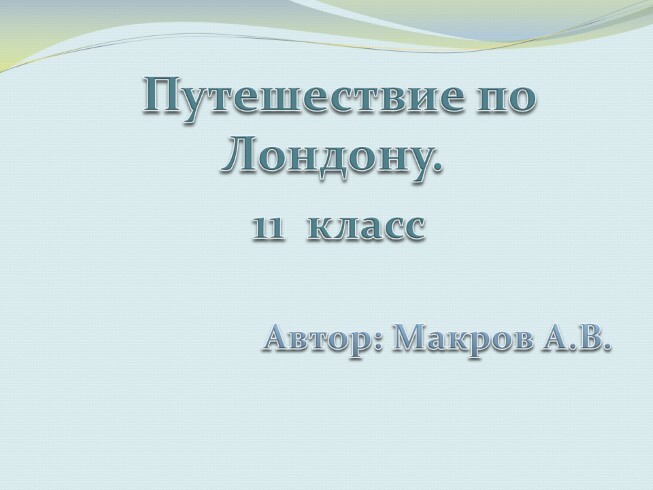 какое значение (утвердительное или отрицательное) слово имеет по контексту? какие суффиксы или префиксы подойдут к выделенному слову справа? По щелчку «мышки» в тексте появляется слово в нужной форме. При прокрутки назад и исчезновении выделенных слов справа учащимся можно дать задание угадать пропущенные в тексте слова. При работе с грамматическим слайдом учащимся следует прочитать текст целиком, чтобы понять последовательность времен и, возможно, найти прямую речь. Потом учащиеся заполняют пропуски, отвечая на следующие вопросы: какая грамматическая форма пропущена: глагол, инфинитив, причастие первое или второе? 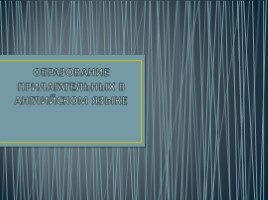 какое нужно грамматическое время и залог (активный –пассивный)? 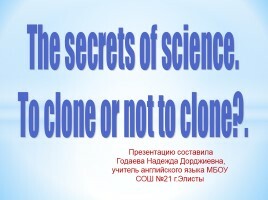 утвердительное или отрицательное значение имеют пропущенные слова? По щелчку «мышки» в тексте появляется слово в нужной форме. При прокрутки назад и исчезновении выделенных слов справа учащимся можно дать задание угадать пропущенные в тексте слова. При работе со слайдом на отработку синонимов следует вначале обязательно прочитать текст целиком про себя, так как выбор синонимов зависит от контекста. Далее следует обратить внимание на окружение пропущенного слова справа и слева и, мысленно подставив разные предлоги и слова, посмотреть, сочетаются ли они между собой. По щелчку «мышки» в тексте появляется слово в нужной форме. При прокрутки назад и исчезновении выделенных слов справа учащимся можно дать задание угадать пропущенные в тексте слова. Данная тренировка помогает учащимся освоить формат ЕГЭ. При этом учащиеся всегда нацелены обращать внимание на предлоги, типичные для данного глагола. Учителям рекомендуется при работе с любым текстом предлагать учащимся подбирать синонимы, проводить трансформации предложений, подставляя глаголы в различные времена и наклонения. Для закрепления работы с экзаменационным материалом будет полезно рекомендовать учащимся дома приготовлять различные задания на отработку отдельных аспектов экзамена (лексика, грамматика, синонимы и предлоги) по образцу ЕГЭ.